[S28] James Alonzo Matthews, Jr. and Lucille Pearce, comps., Pearce, Bartlett, Matthews, Smart, and Allied Families (Austin, Tex. : Eakin Publications, Inc., 1983), p. 121 (naming James Allen Tabor as her father). [S28] James Alonzo Matthews, Jr. et al., Pearce [etc.] and Allied Families, above, p. 121 (naming Frances Malinda Willeford as her mother). [S28] James Alonzo Matthews, Jr. et al., Pearce [etc.] and Allied Families, above, p. 121. [S961] Find A Grave, online at http://www.findagrave.com, memorial for L. Grace Hambright, memorial no. 7581830, viewed on 26 Aug 2013 (giving the year but not the place or other date information). [S961] Find A Grave, online, above, memorial for L. Grace Hambright, memorial no. 7581830, viewed on 26 Aug 2013. [S28] James Alonzo Matthews, Jr. et al., Pearce [etc.] and Allied Families, above, p. 121 (giving her name as Lillie Grace (Tabor) Hambright). [S28] James Alonzo Matthews, Jr. et al., Pearce [etc.] and Allied Families, above, p. 121 (naming Lillie Grace Tabor as her mother). [S28] James Alonzo Matthews, Jr. et al., Pearce [etc.] and Allied Families, above, p. 121 (naming Lillie Grace Tabor as this child's mother). [S28] James Alonzo Matthews, Jr. et al., Pearce [etc.] and Allied Families, above, pp. 121, 122 (naming Lillie Grace Tabor as her mother). [S28] James Alonzo Matthews, Jr. et al., Pearce [etc.] and Allied Families, above, p. 121 (naming Lillie Grace Tabor as his mother). [S28] James Alonzo Matthews, Jr. and Lucille Pearce, comps., Pearce, Bartlett, Matthews, Smart, and Allied Families (Austin, Tex. : Eakin Publications, Inc., 1983), p. 121 (naming James Allen Tabor as his father). [S28] James Alonzo Matthews, Jr. et al., Pearce [etc.] and Allied Families, above, p. 121 (naming Frances Malinda Willeford as his mother). Other Names*: Anne Fortson, Anne Elizabeth Fortson Barrow, Anne Fortson Barrow, Anne Elizabeth Barrow, Anne Barrow. Note*: • From a 1973 family history: "Anne, early in life, adopted 'Elizabeth' as a middle name after her father's sister, to whom she was devoted. She attended Washington, Ga., grammar school when illness necessitated her withdrawing from school for two years, during which time she was tutored by Miss Emily Bluker and Mrs. Mary McKenzie Hill. She graduated from Washington High School a member of the Honor Roll and the Beta Club. She is a graduate of Draughon Business College in Atlanta, and worked for Railway Express Company and the Georgia Department of Revenue. In 1945 she went to New York City to further her education but returned to Atlanta at the death of her father, and went to work for the U.S. Veterans Administration, where she met her future husband. She has always had a wide range of interests, chief among which were literature, art, and music. She has always had a remarkable memory and incidents, poems and stories which other members of her family have long forgotten, she recalls in vivid detail. She is a devoted wife and mother and also works as a secretary to the President of Cook Banking Company in Cochran." [S27] John Wright Boyd, A Family History: Lt. Thomas Fortson (1742-1824) and Some of His Descendants—Early Settler of Elbert County, Georgia (Danielsville, Ga.: Heritage Papers, 1973), pp. 503, 510 (naming Benjamin Wynn Fortson, Sr. as her father). [S27] John Wright Boyd, A Family History: Lt. Thomas Fortson, etc., above, pp. 503, 510 (naming Lillie Elder Wellborn as her mother). [S961] Find A Grave, online at http://www.findagrave.com, memorial for Anne Fortson Barrow, memorial no. 113998231, viewed on 8 Aug 2013. [S27] John Wright Boyd, A Family History: Lt. Thomas Fortson, etc., above, p. 511. [S961] Find A Grave, online, above, memorial for Anne Fortson Barrow, memorial no. 113998231, viewed on 8 Aug 2013 (not giving the date or place). [S961] Find A Grave, online, above, memorial for Charles M. Barrow, Sr., memorial no. 34247323, viewed on 8 Aug 2013 (not giving the date or place). [S27] John Wright Boyd, A Family History: Lt. Thomas Fortson, etc., above, pp. 510-11 (both bullet points). [S27] John Wright Boyd, A Family History: Lt. Thomas Fortson (1742-1824) and Some of His Descendants—Early Settler of Elbert County, Georgia (Danielsville, Ga.: Heritage Papers, 1973), p. 511 (naming Morris Milton Barrow as his father). [S27] John Wright Boyd, A Family History: Lt. Thomas Fortson, etc., above, p. 511 (naming Martha Elvenia Hartley as his mother). [S961] Find A Grave, online at http://www.findagrave.com, memorial for Charles M. Barrow, Sr., memorial no. 34247323, viewed on 8 Aug 2013. [S312] Social Security Death Index, online at http://tinyurl.com/AncestrySSDI, record for Charles M. Barrow, viewed on 8 Aug 2013. [S27] John Wright Boyd, A Family History: Lt. Thomas Fortson, etc., above, p. 511 (with obvious typographical errors corrected). Marriage*: He married Martha Elvenia Hartley. [S27] John Wright Boyd, A Family History: Lt. Thomas Fortson (1742-1824) and Some of His Descendants—Early Settler of Elbert County, Georgia (Danielsville, Ga.: Heritage Papers, 1973), p. 511 (giving the year but not the place or other date information). [S961] Find A Grave, online at http://www.findagrave.com, memorial for Morris Milton Barrow, memorial no. 34247783, viewed on 8 Aug 2013. [S27] John Wright Boyd, A Family History: Lt. Thomas Fortson, etc., above, p. 511 (naming Morris Milton Barrow as his father). Marriage*: She married Morris Milton Barrow. Other Names*: Martha Hartley, Martha Elvenia Hartley Barrow, Martha Elvenia Barrow, Martha Hartley Barrow, Martha Barrow. [S27] John Wright Boyd, A Family History: Lt. Thomas Fortson (1742-1824) and Some of His Descendants—Early Settler of Elbert County, Georgia (Danielsville, Ga.: Heritage Papers, 1973), p. 511. [S27] John Wright Boyd, A Family History: Lt. Thomas Fortson (1742-1824) and Some of His Descendants—Early Settler of Elbert County, Georgia (Danielsville, Ga.: Heritage Papers, 1973), p. 503 (naming Charles John Fortson as his father). [S27] John Wright Boyd, A Family History: Lt. Thomas Fortson, etc., above, p. 503 (naming Iola Leola Sturgis as his mother). [S27] John Wright Boyd, A Family History: Lt. Thomas Fortson, etc., above, p. 503 (giving the date but not the place). [S961] Find A Grave, online at http://www.findagrave.com, memorial for Benjamin Wynn Fortson, memorial no. 90186971, viewed on 8 Aug 2013. [S27] John Wright Boyd, A Family History: Lt. Thomas Fortson, etc., above, p. 501. [S27] John Wright Boyd, A Family History: Lt. Thomas Fortson, etc., above, p. 503. [S961] Find A Grave, online, above, memorial for Benjamin Wynn Fortson, memorial no. 90186971, viewed on 8 Aug 2013 (giving the date but not the place). [S1264] Georgia Death Index, online at http://tinyurl.com/m3b2zfy, record for B. W. Fortson, Sr., viewed on 8 Aug 2013. [S27] John Wright Boyd, A Family History: Lt. Thomas Fortson, etc., above, p. 503 (naming Benjamin Wynn Fortson, Sr. as his father). [S27] John Wright Boyd, A Family History: Lt. Thomas Fortson, etc., above, pp. 503, 504 (naming Benjamin Wynn Fortson, Sr. as his father). [S27] John Wright Boyd, A Family History: Lt. Thomas Fortson, etc., above, pp. 503, 506 (naming Benjamin Wynn Fortson, Sr. as his father). [S27] John Wright Boyd, A Family History: Lt. Thomas Fortson, etc., above, pp. 503, 509 (naming Benjamin Wynn Fortson, Sr. as his father). [S27] John Wright Boyd, A Family History: Lt. Thomas Fortson, etc., above, pp. 503, 510 (naming Benjamin Wynn Fortson, Sr. as her father). Other Names*: Lillie Wellborn, Lillie Elder Wellborn Fortson, Lillie Wellborn Fortson, Lillie Elder Fortson, Lillie Fortson. [S27] John Wright Boyd, A Family History: Lt. Thomas Fortson (1742-1824) and Some of His Descendants—Early Settler of Elbert County, Georgia (Danielsville, Ga.: Heritage Papers, 1973), p. 503 (naming Silas Mercer Wellborn as her father). [S27] John Wright Boyd, A Family History: Lt. Thomas Fortson, etc., above, p. 503 (naming Emma Aseneth Griffith as her mother). [S961] Find A Grave, online at http://www.findagrave.com, memorial for Lillie Wellborn Fortson, memorial no. 90187061, viewed on 8 Aug 2013 (giving the date but not the place). [S312] Social Security Death Index, online at http://tinyurl.com/AncestrySSDI, record for Lillie W. Fortson, viewed on 8 Aug 2013 (giving the date but not the place). [S312] Social Security Death Index, online at http://tinyurl.com/AncestrySSDI, record for Lillie W. Fortson, viewed on 8 Aug 2013 (stating that she died in Apr 1974; not naming the place of death but stating that she lived in Atlanta, Ga. when she died). [S1264] Georgia Death Index, online at http://tinyurl.com/m3b2zfy, record for Lillie W. Fortson, viewed on 8 Aug 2013. [S961] Find A Grave, online, above, memorial for Lillie Wellborn Fortson, memorial no. 90187061, viewed on 8 Aug 2013. [S27] John Wright Boyd, A Family History: Lt. Thomas Fortson, etc., above, p. 503 (naming Lillie Elder Wellborn as his mother). [S27] John Wright Boyd, A Family History: Lt. Thomas Fortson, etc., above, pp. 503, 504 (naming Lillie Elder Wellborn as his mother). [S27] John Wright Boyd, A Family History: Lt. Thomas Fortson, etc., above, pp. 503, 506 (naming Lillie Elder Wellborn as his mother). [S27] John Wright Boyd, A Family History: Lt. Thomas Fortson, etc., above, pp. 503, 509 (naming Lillie Elder Wellborn as his mother). Marriage*: He married Emma Aseneth Griffith. [S27] John Wright Boyd, A Family History: Lt. Thomas Fortson (1742-1824) and Some of His Descendants—Early Settler of Elbert County, Georgia (Danielsville, Ga.: Heritage Papers, 1973), p. 503. [S27] John Wright Boyd, A Family History: Lt. Thomas Fortson, etc., above, p. 503 (naming Silas Mercer Wellborn as her father). Marriage*: She married Silas Mercer Wellborn. Other Names*: Emma Griffith, Emma Aseneth Griffith Wellborn, Emma Aseneth Wellborh, Emma Griffith Wellborn, Emma Wellborn. Other Names*: Benjamin Fortson, Ben Fortson. Note*: • From a Fortson family history: "[He] attended school in Arlington, Ga., Emory Academy, Oxford, Ga., Starkes University School, Montgomery, Ala., where he won the Hill Speaker's Award, the Holtzclaw Medal for the outstanding essay on a current topic (What Shall Be Done With Muscle Shoals? - later to become TVA), and a military medal for bravery." • More from the Fortson family history: "Attended Georgia Institute of Technology for one year, where he won 'T' as lightweight champion of the boxing team. Employed Citizens National Bank, Washington, Ga., Atlanta and Lowery National Bank and Trust Company of Georgia, Atlanta, and Washington Loan & Banking Company, Washington, Ga."
• More from the Fortson family history: "In the spring of 1929 he received a spinal injury in an automobile accident, causing paralysis of both legs, and has since been confined to a wheelchair. In 1938 he was elected without opposition to the State Senate where he served two terms; he was unopposed in his two elections to the House of Representatives. 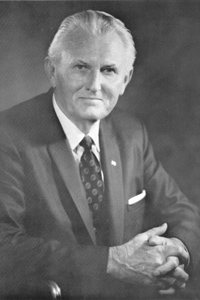 Appointed by Governor Ellis Arnall on February 25, 1946 as Secretary of State, he has been reelected without opposition four times and is in office in 1969." • More from the Fortson family history: "Former Trustee of Mary Willis Library, Washington, Ga., an honorary member of Alpha Kappa Psi and Pi Sigma Alpha, a Methodist, 32nd Degree Mason, and Moose. Honorary LL.D. from John Marshall Law School. In 1967 he received the 'Great Georgian' award and in 1968 was named 'Georgian of the Year' by the Georgia Association of Broadcasters." • His biography in Wikipedia is here. • An article about him in The New Georgia Encyclopedia, which includes several photographs, is here. • "Ben Fortson had a way about him," a reminisence by Ronda Rich published on 18 Jun 2017 in the FocusHill, is here. [S27] John Wright Boyd, A Family History: Lt. Thomas Fortson (1742-1824) and Some of His Descendants—Early Settler of Elbert County, Georgia (Danielsville, Ga.: Heritage Papers, 1973), p. 503 (naming Lillie Elder Wellborn as his mother). [S312] Social Security Death Index, online at http://tinyurl.com/AncestrySSDI, record of Benjamin Fortson, viewed on 8 Aug 2013 (giving the date but not the place). [S961] Find A Grave, online at http://www.findagrave.com, memorial for Ben Fortson, memorial no. 39375410, viewed on 8 Aug 2013. [S961] Find A Grave, online, above, memorial for Mary Cade Fortson, memorial no. 45370872, viewed on 8 Aug 2013 (not giving the date or place). [S961] Find A Grave, online, above, memorial for Ben Fortson, memorial no. 39375410, viewed on 8 Aug 2013 (not giving the date or place). [S312] Social Security Death Index, online at http://tinyurl.com/AncestrySSDI, record of Benjamin Fortson, viewed on 8 Aug 2013 (stating that he died in May 1979; not naming the place of death but stating that he lived in Atlanta, Ga. when he died). [S961] Find A Grave, online, above, memorial for Ben Fortson, memorial no. 39375410, viewed on 8 Aug 2013 (fifth bullet). [S27] John Wright Boyd, A Family History: Lt. Thomas Fortson, etc., above, p. 503 (first bullet). [S27] John Wright Boyd, A Family History: Lt. Thomas Fortson, etc., above, p. 504 (second bullet). [S27] John Wright Boyd, A Family History: Lt. Thomas Fortson, etc., above, p. 504 (third bullet). [S27] John Wright Boyd, A Family History: Lt. Thomas Fortson, etc., above, p. 504 (fourth bullet). [S961] Find A Grave, online, above, memorial for Ann McNeill Fortson Mandus, memorial no. 114278678, viewed on 8 Aug 2013 (naming Ben Fortson as her father). [S1265] Obituary of Ann McNeill Fortson Mandus, on web site of The New Mexican, Santa Fe, N.M., at http://tinyurl.com/ljksn7z, viewed on 8 Aug 2013 (naming Benjamin W. Fortson, Jr. as her father). [S27] John Wright Boyd, A Family History: Lt. Thomas Fortson, etc., above, p. 504 (naming Benjamin Wynn Fortson, Jr. as her father). [S27] John Wright Boyd, A Family History: Lt. Thomas Fortson (1742-1824) and Some of His Descendants—Early Settler of Elbert County, Georgia (Danielsville, Ga.: Heritage Papers, 1973), pp. 503, 504 (naming Benjamin Wynn Fortson, Sr. as his father). [S312] Social Security Death Index, online at http://tinyurl.com/AncestrySSDI, record for Charles W. Fortson, viewed on 8 Aug 2013 (giving the date but not the place). [S1264] Georgia Death Index, online at http://tinyurl.com/m3b2zfy, record for Charles W. Fortson, viewed on 8 Aug 2013. [S27] John Wright Boyd, A Family History: Lt. Thomas Fortson, etc., above, pp. 504-505. [S27] John Wright Boyd, A Family History: Lt. Thomas Fortson (1742-1824) and Some of His Descendants—Early Settler of Elbert County, Georgia (Danielsville, Ga.: Heritage Papers, 1973), pp. 503, 506 (naming Benjamin Wynn Fortson, Sr. as his father). [S312] Social Security Death Index, online at http://tinyurl.com/AncestrySSDI, record for George Fortson, viewed on 8 Aug 2013 (giving the date but not the place). [S27] John Wright Boyd, A Family History: Lt. Thomas Fortson, etc., above, p. 503 (stating that he was born on 22 Apr 1911 in Arlington, Georgia). [S27] John Wright Boyd, A Family History: Lt. Thomas Fortson, etc., above, pp. 506-7. [S27] John Wright Boyd, A Family History: Lt. Thomas Fortson, etc., above, pp. 503 (stating that he was born on 22 Apr 1911 in Arlington, Georgia), 506 (stating that he was born on 22 Apr 1911 without naming the place). Biography*: From a family history: He "attended Arlington and Washington, Ga., schools, graduating Valedictorian from Washington High School. At age 13, clerked after school and on week-ends in grocery store and drug store throughout high school. Attended Georgia Institute of Technology for two years, where he was one of eighteen selected to be admitted to Guggenheim Aeronautical School, but the Depression barred further college career and he enlisted in the Civilian Conservation Corps, stationed at CCC Camp Ga-F-3, Robertson, Ga., in the Chattahoochee National Forest. In 1934, lived with his cousin, Mary Irvin Hill, and her husband, Frank Hill, on farm in Meriwether County, working his own 12 acres of cotton from which he cleared $75. With this, he entered University of Georgia Law School in 1935, and aided by such work as NYA job in the law library, waiting tables in boarding house for meals, selling Bibles in summer to farmers in the North Carolina tobacco belt, he completed three years to get LL.B. degree in December 1937. "Employed with Aetna Casualty & Surety Company in 1938, and worked as claim adjuster in New Orleans. In 1939 joined the Legal Department of Coca-Cola Company and for over three years traveled the United States as a special investigator in trade-mark infringement. When World War II began, he was over age for Navy officer training but entered a similar Coast Guard program, attending Coast Guard Academy and was commissioned Ensign in September 1942. Special diesel engineering school at Cornell University and at Fairbanks-Morse Company, Beloit, Wisconsin; shipyard duty in Quebec, Canada and Long Beach, Cal. Served 14 months with 5th Amphibious Fleet in Pacific as Engineering Officer of L.S.T. 23, taking part in amphibious landings at Saipan, Tinian, Pelelieu, Lingayen Gulf, and San Fabian. Released from service as Lieutenant, Senior Grade, in November 1945. "In January 1946, entered the practice of law in Barnesville, Ga., in partnership with Harvey J. Kennedy, then Mayor of Barneswille, and later Judge of Superior Courts, Flint Circuit. Moved to Athens in April 1949, where practiced law alone until 1953 when formed partnership with Robert G. Stephens, Jr. (now U.S. Congressman), Upshaw C. Bentley, Jr., and John E. Griffin. The present firm is Fortson, Bentley & Griffin, with seven members. • His online obituary from the Gainesville Times, Gainesville, Florida, is here. [S27] John Wright Boyd, A Family History: Lt. Thomas Fortson (1742-1824) and Some of His Descendants—Early Settler of Elbert County, Georgia (Danielsville, Ga.: Heritage Papers, 1973), p. 503 (naming Benjamin Wynn Fortson, Sr. as his father). [S312] Social Security Death Index, online at http://tinyurl.com/AncestrySSDI, record for Edwin B. Fortson, viewed on 8 Aug 2013 (giving the date but not the place). [S27] John Wright Boyd, A Family History: Lt. Thomas Fortson, etc., above, pp. 507-8 (with obvious typographical errors corrected). [S27] John Wright Boyd, A Family History: Lt. Thomas Fortson (1742-1824) and Some of His Descendants—Early Settler of Elbert County, Georgia (Danielsville, Ga.: Heritage Papers, 1973), pp. 503, 509 (naming Benjamin Wynn Fortson, Sr. as his father). [S27] John Wright Boyd, A Family History: Lt. Thomas Fortson, etc., above, pp. 503, 509. [S312] Social Security Death Index, online at http://tinyurl.com/AncestrySSDI, record for Frederick O. Fortson, viewed on 8 Aug 2013 (giving the date but not the place). [S312] Social Security Death Index, online at http://tinyurl.com/AncestrySSDI, record for Frederick O. Fortson, viewed on 8 Aug 2013 (stating that he died on 4 Sep 2003; not naming the place of death but stating that he lived in Ann Arbor, Mich. when he died). [S27] John Wright Boyd, A Family History: Lt. Thomas Fortson, etc., above, pp. 509-10. [S1263] Obituary of Anne Fortson Barrow, on web site of Mathis Funeral Home, Inc., Cochran, Ga., at http://tinyurl.com/kbhdgsv, viewed on 7 Aug 2013 (referring to him as Fred O. Fortson). [S27] John Wright Boyd, A Family History: Lt. Thomas Fortson, etc., above, p. 510 (naming Frederick Ogilvie Fortson as her stepfather). [S27] John Wright Boyd, A Family History: Lt. Thomas Fortson, etc., above, pp. 503, 510. [S961] Find A Grave, online at http://www.findagrave.com, memorial for Mary Fortson, memorial no. 90187089, viewed on 8 Aug 2013 (giving the date but not the place). [S312] Social Security Death Index, online at http://tinyurl.com/AncestrySSDI, record for Mary Fortson, viewed on 8 Aug 2013 (giving the date but not the place). [S1264] Georgia Death Index, online at http://tinyurl.com/m3b2zfy, record for Mary Fortson, viewed on 8 Aug 2013. [S961] Find A Grave, online, above, memorial for Mary Fortson, memorial no. 90187089, viewed on 8 Aug 2013. [S27] John Wright Boyd, A Family History: Lt. Thomas Fortson, etc., above, p. 510. Other Names*: Mary Cade Fortson, Mary Fortson. • Her Find A Grave memorial is here. A picture of her grave marker is on her husband's Find A Grave memorial here. [S27] John Wright Boyd, A Family History: Lt. Thomas Fortson (1742-1824) and Some of His Descendants—Early Settler of Elbert County, Georgia (Danielsville, Ga.: Heritage Papers, 1973), p. 504 (naming Benjamin Cade as her father). [S961] Find A Grave, online at http://www.findagrave.com, memorial for Mary Cade Fortson, memorial no. 45370872, viewed on 8 Aug 2013. [S961] Find A Grave, online, above, memorial for Mary Cade Fortson, memorial no. 45370872, viewed on 8 Aug 2013 (giving the date but not the place). [S1264] Georgia Death Index, online at http://tinyurl.com/m3b2zfy, record for Mary C. Fortson, viewed on 8 Aug 2013. [S27] John Wright Boyd, A Family History: Lt. Thomas Fortson, etc., above, p. 504 (giving the date but not the place). [S961] Find A Grave, online, above, memorial for Mary Cade Fortson, memorial no. 45370872, viewed on 8 Aug 2013 (naming the cemetery but not the plot). [S961] Find A Grave, online, above, memorial for Ben Fortson, memorial no. 39375410, viewed on 8 Aug 2013 (including a picture of the marker for her and her husband and stating that it is in the Cade plot). [S961] Find A Grave, online, above, memorial for Ann McNeill Fortson Mandus, memorial no. 114278678, viewed on 8 Aug 2013 (naming Mary Cade as her mother). [S1265] Obituary of Ann McNeill Fortson Mandus, on web site of The New Mexican, Santa Fe, N.M., at http://tinyurl.com/ljksn7z, viewed on 8 Aug 2013 (naming Mary Cade as her mother). [S27] John Wright Boyd, A Family History: Lt. Thomas Fortson, etc., above, p. 504 (naming Mary Cade as her mother). [S961] Find A Grave, online at http://www.findagrave.com, memorial for Ann McNeill Fortson Mandus, memorial no. 114278678, viewed on 8 Aug 2013 (naming Mary Cade as her mother). [S27] John Wright Boyd, A Family History: Lt. Thomas Fortson (1742-1824) and Some of His Descendants—Early Settler of Elbert County, Georgia (Danielsville, Ga.: Heritage Papers, 1973), p. 504 (naming Mary Cade as her mother). [S1265] Obituary of Ann McNeill Fortson Mandus, online, above (naming Benjamin W. Fortson, Jr. as her father). [S961] Find A Grave, online, above, memorial for Ann McNeill Fortson Mandus, memorial no. 114278678, viewed on 8 Aug 2013. [S1265] Obituary of Ann McNeill Fortson Mandus, online, above. [S27] John Wright Boyd, A Family History: Lt. Thomas Fortson, etc., above, p. 504 (using Walker as his middle name). [S961] Find A Grave, online, above, memorial for Ann McNeill Fortson Mandus, memorial no. 114278678, viewed on 8 Aug 2013 (not giving the date or place). [S961] Find A Grave, online, above, memorial for George Mandus, memorial no. 114278857, viewed on 8 Aug 2013 (not giving the date or place). [S1265] Obituary of Ann McNeill Fortson Mandus, online, above (giving the year but not the full date or the place). [S27] John Wright Boyd, A Family History: Lt. Thomas Fortson, etc., above, p. 504 (giving the date and place and stating that Rev. H. C. Emery officiated and Mary Cade Hiers was the only attendant). [S1281] The Augusta Chronicle, Augusta, Ga., 31 Dec 1953, sec. A, p. 13, col. 5 ("Washington society gay for the holidays") (spelling her name as Anne." [S1281] The Augusta Chronicle, Augusta, Ga., 31 Dec 1953, sec. A, p. 13, col. 5 ("Washington society gay for the holidays"). Note*: • He was a portrait artist in Atlanta, Georgia, an architect who specialized in drawings of bridges, and a musician who played the bagpipes. He was a member of Oglethorpe Presbyterian Church in Atlanta. He and his wife maintained homes there and in Santa Fe, New Mexico. His remains were cremated. [S27] John Wright Boyd, A Family History: Lt. Thomas Fortson (1742-1824) and Some of His Descendants—Early Settler of Elbert County, Georgia (Danielsville, Ga.: Heritage Papers, 1973), p. 504 (naming Stephen Mandus as his father). [S961] Find A Grave, online at http://www.findagrave.com, memorial for George Mandus, memorial no. 114278857, viewed on 8 Aug 2013 (giving the year and state but no other birth information). [S1266] Obituary of George Mandus, on web site of the Atlanta Journal-Constitution, Atlanta, Ga., at http://tinyurl.com/mnx7blk, viewed on 8 Aug 2013 (stating that he was born in Pennsylvania in 1924). [S27] John Wright Boyd, A Family History: Lt. Thomas Fortson, etc., above, p. 504 (giving the full date and stating that he was born in Hendersonville, Pennsylvania). [S1265] Obituary of Ann McNeill Fortson Mandus, on web site of The New Mexican, Santa Fe, N.M., at http://tinyurl.com/ljksn7z, viewed on 8 Aug 2013 (giving the year but not the full date or the place). [S961] Find A Grave, online, above, memorial for George Mandus, memorial no. 114278857, viewed on 8 Aug 2013. [S1266] Obituary of George Mandus, online, above. [S1265] Obituary of Ann McNeill Fortson Mandus, online, above (first bullet). [S1266] Obituary of George Mandus, online, above (first bullet). [S189] Navarro County Cemetery Records, vol. 9 (Corsicana, Tex. : The Navarro County Gen. Soc'y, 1989), p. 112 (naming J. L. Halbert as her father). [S189] Navarro County Cemetery Records, vol. 9 (Corsicana, Tex. : The Navarro County Gen. Soc'y, 1989), p. 112 (naming J. L. Halbert as his father). [S961] Find A Grave, online at http://www.findagrave.com, memorial for Ermengarde Markgraff, memorial no. 115414362, viewed on 20 Aug 2013 (naming Beatrice Elizabeth Winkler as her mother). [S961] Find A Grave, online, above, memorial for Ermengarde Markgraff, memorial no. 115414362, viewed on 20 Aug 2013 (naming George F. Markgraff as her father). [S961] Find A Grave, online, above, memorial for Ermengarde Markgraff, memorial no. 115414362, viewed on 20 Aug 2013. [S961] Find A Grave, online, above, memorial for Ermengarde Markgraff, memorial no. 115414362, viewed on 20 Aug 2013 (including a picture of her grave marker that gives the name Ermen Markgraff). [S1274] El Paso Herald, El Paso, Tex., 28 Jul 1914, p. 5, col. 1 (in "Society's Doings" feature). Marriage*: He married Augusta L. Markgraff, daughter of George F. Markgraff and Beatrice Elizabeth Winkler. [S961] Find A Grave, online at http://www.findagrave.com, memorial for Archie Auld McFadin, memorial no. 76290903, viewed on 22 Aug 2013 (naming Joseph Oliver McFadin as his father). [S961] Find A Grave, online, above, memorial for Archie Auld McFadin, memorial no. 76290903, viewed on 22 Aug 2013 (naming Mary Ida Gibbens as his mother). [S961] Find A Grave, online, above, memorial for Archie Auld McFadin, memorial no. 76290903, viewed on 22 Aug 2013. Marriage*: She married George W. Armstrong. Other Names*: Lula McFadin, Ludy McFadin, Lula McFadin Armstrong, Ludy McFadin Armstrong, Lula Armstrong, Ludy Armstrong. [S961] Find A Grave, online at http://www.findagrave.com, memorial for Lula 'Ludy' McFadin Armstrong, memorial no. 82778221, viewed on 22 Aug 2013 (naming Joseph Oliver McFadin as her father). [S961] Find A Grave, online, above, memorial for Lula 'Ludy' McFadin Armstrong, memorial no. 82778221, viewed on 22 Aug 2013 (naming Mary Ida Gibbens as her mother). [S961] Find A Grave, online, above, memorial for Lula 'Ludy' McFadin Armstrong, memorial no. 82778221, viewed on 22 Aug 2013. Marriage*: He married Lula ('Ludy') McFadin, daughter of Joseph Oliver ('Joe') McFadin and Mary Ida ('Dolly') Gibbens. [S961] Find A Grave, online at http://www.findagrave.com, memorial for George W. Armstrong, memorial no. 82778286, viewed on 22 Aug 2013. [S961] Find A Grave, online, above, memorial for George W. Armstrong, memorial no. 82778286, viewed on 22 Aug 2013 (based on the photograph of his grave marker that is included with his memorial). [S961] Find A Grave, online at http://www.findagrave.com, memorial for James Arnett McFadin, memorial no. 76290809, viewed on 22 Aug 2013 (naming Joseph Oliver McFadin as his father). [S961] Find A Grave, online, above, memorial for James Arnett McFadin, memorial no. 76290809, viewed on 22 Aug 2013 (naming Mary Ida Gibbens as his mother). [S961] Find A Grave, online, above, memorial for James Arnett McFadin, memorial no. 76290809, viewed on 22 Aug 2013. Other Names*: Baby Lea McFadin Mason, Baby Lea Mason. [S961] Find A Grave, online at http://www.findagrave.com, memorial for Baby Lea McFadin Mason, memorial no. 75774456, viewed on 22 Aug 2013 (naming Joseph Oliver McFadin as her father). [S961] Find A Grave, online, above, memorial for Baby Lea McFadin Mason, memorial no. 75774456, viewed on 22 Aug 2013 (naming Mary Ida Gibbens as her mother). [S961] Find A Grave, online, above, memorial for Baby Lea McFadin Mason, memorial no. 75774456, viewed on 22 Aug 2013. [S961] Find A Grave, online, above, memorial for Frederick Sommerfield Mason, memorial no. 76290681, viewed on 22 Aug 2013. [S961] Find A Grave, online at http://www.findagrave.com, memorial for Frederick Sommerfield Mason, memorial no. 76290681, viewed on 22 Aug 2013. [S961] Find A Grave, online at http://www.findagrave.com, memorial for Joseph Frank McFadin, memorial no. 76291257, viewed on 22 Aug 2013 (naming Joseph Oliver McFadin as his father). [S961] Find A Grave, online, above, memorial for Joseph Frank McFadin, memorial no. 76291257, viewed on 22 Aug 2013 (naming Mary Ida Gibbens as his mother). [S961] Find A Grave, online, above, memorial for Joseph Frank McFadin, memorial no. 76291257, viewed on 22 Aug 2013. Birth*: He was born circa 1898 in Arkansas. Marriage*: He married May _____. Death*: He died on 23 March 1978 in Oklahoma City, Oklahoma County, Oklahoma. Birth*: She was born circa 1901 in Oklahoma. Marriage*: She married Oliver Stell Alexander. [S28] James Alonzo Matthews, Jr. and Lucille Pearce, comps., Pearce, Bartlett, Matthews, Smart, and Allied Families (Austin, Tex. : Eakin Publications, Inc., 1983), p. 121 (naming Amos Hambright as his father). [S961] Find A Grave, online at http://www.findagrave.com, memorial for John E. Hambright, memorial no. 7581829, viewed on 26 Aug 2013 (giving the year but no other information). [S961] Find A Grave, online, above, memorial for John E. Hambright, memorial no. 7581829, viewed on 26 Aug 2013. [S28] James Alonzo Matthews, Jr. et al., Pearce [etc.] and Allied Families, above, p. 121 (naming John Elliott Hambright, Sr. as her father). [S28] James Alonzo Matthews, Jr. et al., Pearce [etc.] and Allied Families, above, p. 121 (naming John Elliott Hambright, Sr. as this child's father). [S28] James Alonzo Matthews, Jr. et al., Pearce [etc.] and Allied Families, above, pp. 121, 122 (naming John Elliott Hambright, Sr. as her father). [S28] James Alonzo Matthews, Jr. et al., Pearce [etc.] and Allied Families, above, p. 121 (naming John Elliott Hambright, Sr. as his father).